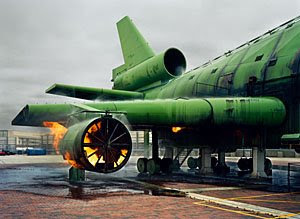 A year ago in Source magazine I discovered some incredible photos by Richard Mosse of aircraft in pieces, on fire and otherwise not as we'd wish to see them. It turns out that many of these are not vehicles but rather full-size mock-ups, used to practice emergency procedures such as dousing fires and rapid escapes. These scenes immediately bring to mind the virtual accidents of which Virilio wrote, in his articles on military space, speed and politics. "One exposes the accident in order not to be exposed to the accident" said Virilio in the interview Cyberwar, God And Television. Accident preparation enables us to view the accident as just another item on the agenda; the accident becomes an occurrence in the world that we are trained to deal with. It is no longer unexpected and intrusive, no longer an accident at all, in fact. The simulated air crash transforms the actual air crash into a normative event. In my last article I covered nine different possible lens combinations for your holiday kit, ranging from single primes to a super-zoom to multiple lens setups. Each has its own advantages and limitations. Today I'll discuss one final configuration, my current choice when travelling with two camera bodies and two photographers. First I'll make some general points, then I'll reveal my lens line-up and finally I'll present a handy table summarising all the possibilities.